This recipe comes straight from Grandma Cavallari’s kitchen. She pronounces it “yon-key” and it was one of the first recipes I learned to make from her. Although I experienced a couple of hiccups after my first lesson due to lack of flour (you can never use too much in this recipe), it really has proven to be an easy and tasty way to enjoy homemade pasta. I think my jaw hit the floor, and my husband too, when she showed us her secret tomato sauce…Prego Traditional Pasta Sauce. Grandma swore that it tasted almost as good as the homemade version that she made, but this took a lot less time so we only use Prego now. Oh, and can I also mention how inexpensive this recipe is too? Give it a try this winter and let me know how it worked for you. Potato Ricer – a stainless steel kitchen tool that presses potatoes through a sheet of small holes leaving them light and fluffy without mashing. 1. Bring a large pot of salted water to a boil. Peel potatoes and place them carefully into pot of boiling water. 2. Allow potatoes to cook until tender when pierced with a fork, roughly 15-20 minutes. Take potatoes out of pot by placing them into a bowl. Drain pot and refill with fresh water. Add salt and bring water back to a boil. 3. Place pot near your work surface, preferably a clean countertop. Place half of a potato into ricer and press down so that potato pieces fall into a mountain-like pile. 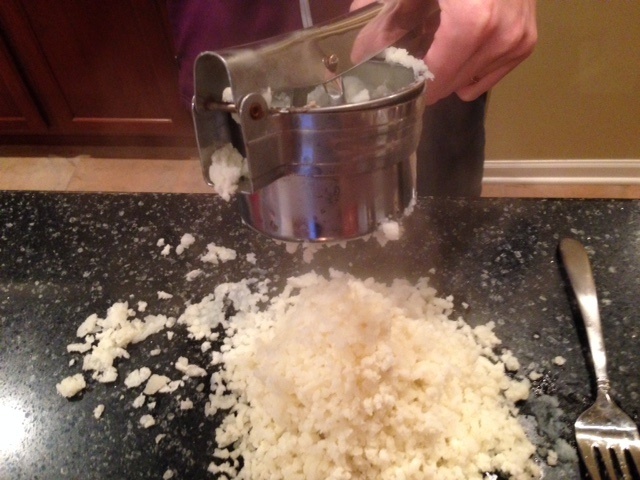 Continue to press remaining potatoes through ricer. 4. Working quickly while the potatoes are still hot, place a pile of flour equal to the pile of potatoes next to one another. Combine potatoes and flour until you have formed a nice dough into a ball. Be careful working with the hot potatoes. The mixture must be hot or it will not be the consistency you want it. 5. 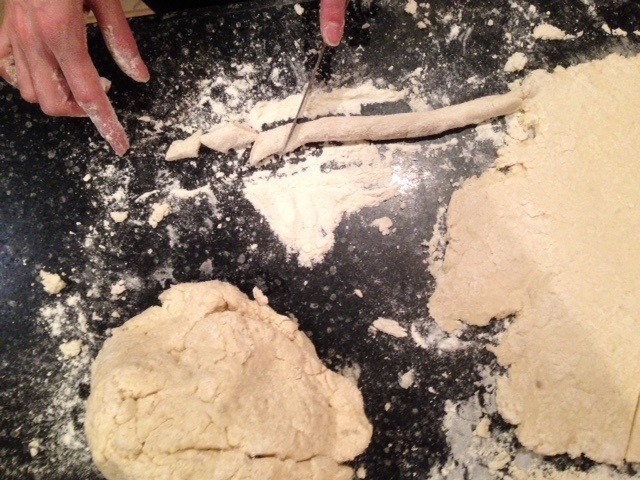 Sprinkle flour on your work surface and roll out your dough with a rolling pin. 6. Using a knife cut strips about 1/2 inch to an inch wide. 7. 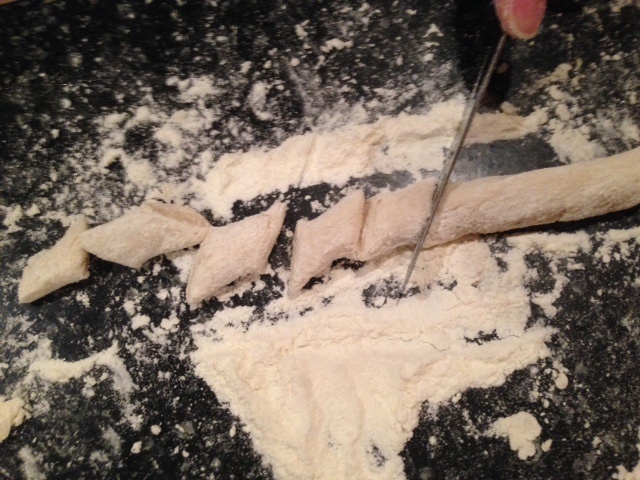 Using more flour, roll each strip into a rope shape. 8. Cut each strip on the diagonal into 1 inch pieces. 9. Once pieces are cut, place them into the remaining pot of water. Stir constantly. They don’t take long to cook and once they begin to float, you know they are fully cooked. 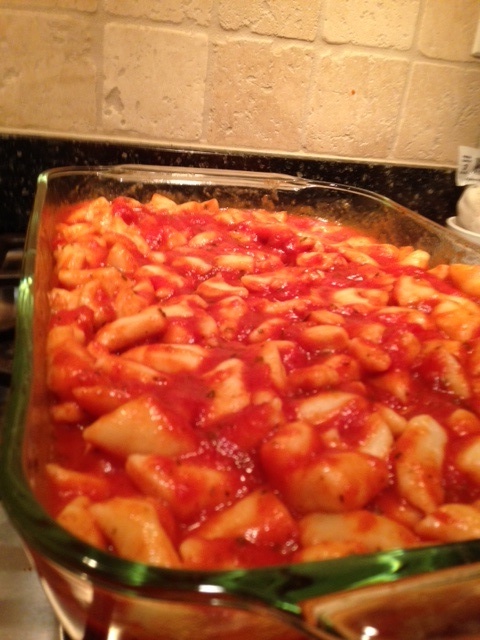 Drain pasta and place in a large, rectangular dish. Pour Prego on top as well as grated Parmesan cheese. Bake in the oven at 350 degrees until cheese is melted, about 10 minutes. Using the ricer. See the steam? I wasn’t kidding when I said it’s hot! Cutting pieces of potato pasta. They look like cute, little pillows. Tip: we accidentally used bread flour instead of all-purpose (long story) and it made the pasta more al dente. I would try that mistake again. The Schramsberg winery was founded by German immigrant, Jacob Schram on Diamond Mountain in 1862. The winery closed in 1912, but the Davies family reopened it in 1957. One fun piece of trivia: Schramsberg is the official sparkling wine for the White House since its introduction back in 1972 when Nixon made a “Toast to Peace” with China’s Premier Zhou Enlai. The Brut Sonoma County Green Valley is vintage 2009 and made entirely from Chardonnay grapes in a Blanc de Blancs style. The wine was like a lightly browned sugar cookie in color with a moderate amount of bubbles. It tasted crisp, nutty and with a tang of citrus on the finish. Each time we tipped our glass for another sip, our mouths were watering (literally!) for more. Because of the year, this wine is sold out. However, you can find Schramsberg at most wine stores. Their 2014 Blanc de Blancs runs for about $33. This wine is a great option when you want to enjoy it with a variety of foods and just about any occasion. Thank you Dr. Jeff and Dr. Charlotte for sharing this one with us!